Behind the bar of San Francisco’s Four Seasons Hotel last March, a set of doors led into an empty cafe room where an unknown, 25-year-old British-Nigerian entrepreneur named Silas Adekunle was about to meet a senior executive at Apple. If he was nervous, Adekunle didn’t show it. He smiled and opened up a large suitcase. It was filled with colorful robots that looked at first like toys. When he took one out and set it on the floor, it came alive. Called a Mekamon, it raced, spider-like across a mat on four pointed legs, trotting daintily before bowing, and performing a dramatic death shudder. Adekunle took out his phone and pointed it at the Mekamon, and now on his screen it was surrounded by glowing lights, facing an animated opponent that it could shoot lasers at. Apple’s head of developer relations, Ron Okamoto, carefully surveyed the other robots, then peppered Adekunle with questions about motors and articulations. “It’s got character,” he noted. 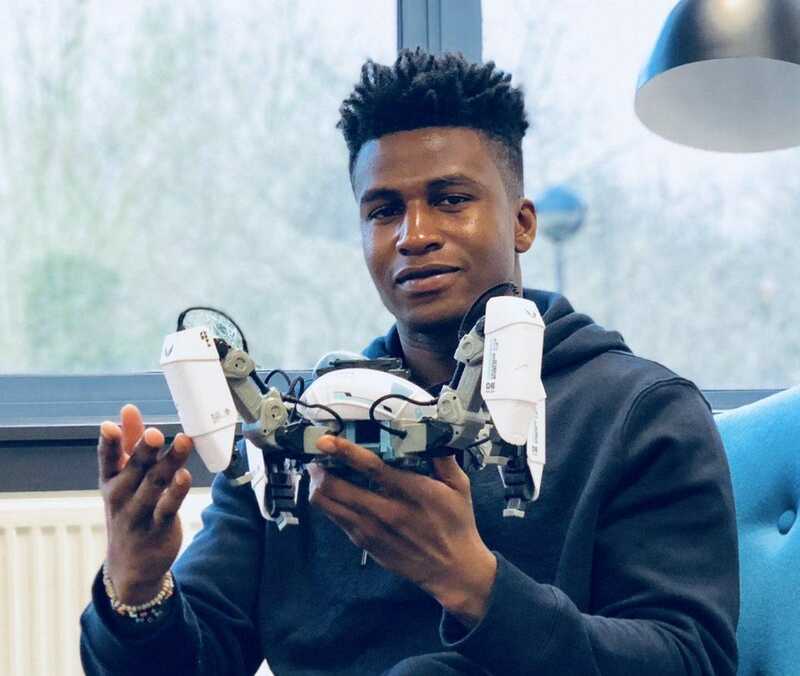 A year on and Adekunle, who at 26 is part of Forbes’ latest 30 Under 30 list for European Technology launched this week, is on course to sell plenty of Mekamon robots thanks to an exclusive distribution deal he signed in November 2017 after “spending some time in Cupertino” and meeting Apple’s retail executives. Impressed by the quality of his robots and their ability to show emotion with subtly-calibrated movements, Apple priced his four-legged “battle-bots” at $300 and has put them in nearly all of its stores in the United States and Britain. Early customers skew towards male techies but a growing number of parents are buying the robots for their children to get them interested in STEM, Adekunle says. What he hadn’t known during that first meeting at the Four Seasons: Apple was about to launch ARKit, its very first platform for augmented reality. AR is the cutting-edge technology that mixes digital animations with the real world, on smartphones screens, popularized by Pokemon Go and expected to go further with the face and object tracking technology in Apple’s latest iPhone X. With no track record, Adekunle and his team of nine were suddenly working with the world’s biggest brand. Robots might already be changing the nature of warehouse management for retailers and other industries, but they’re gradually making their way into our homes too, helped along by people’s increasing ease with artificial entities like Amazon’s Alexa. Adekunle hopes his anthropomorphised robot-spiders will be as popular, say, as iRobot’s Roomba vacuum cleaner. Trends point that way. Analysts at IDC predict that in three years, the market for consumer robots will have doubled. Next generation AI robots will be focused less on physical tasks, and more on teaching and interacting with family members, says Jing Bing Zhang, the research director of IDC Worldwide Robotics. 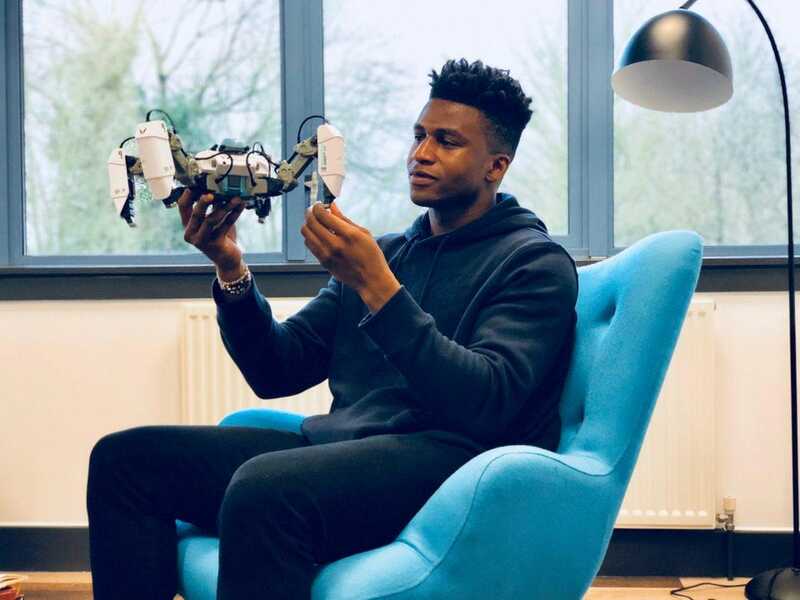 On a more recent Monday morning in January 2018, Adekunle is standing in the corridor of Reach Robotics in Bristol, UK, and staring at a hunk of wires and melted plastic. It’s the first prototype he made in his college dorm room, and is on display as a reminder of how far his startup has come. The Mekamon today looks a lot more cutting edge, something like a cross between a crab and a spider, but unlike either of those animals, it has no features resembling a pair of eyes or mouth. Adekunle decided that his robots could use motion to get an emotional reaction from humans. “I love motion,” he says. 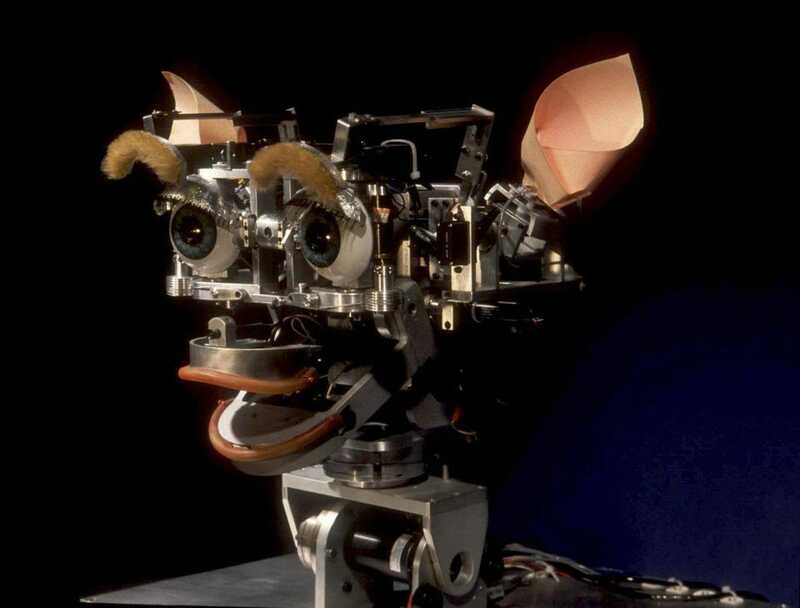 Back when he was first tinkering on a robotic prototype while he was at the University of West England, around 2012, several robotic pets like the Sony Aibo robot dog were already hitting the market. The trouble was that most of these personified gadgets cost a fortune. Sony’s latest version of the Aibo costs $1,700 plus a subscription fee. The Mekamon costs $300, (or £300 in the UK) and future updates to its firmware will see it take on further characteristics. 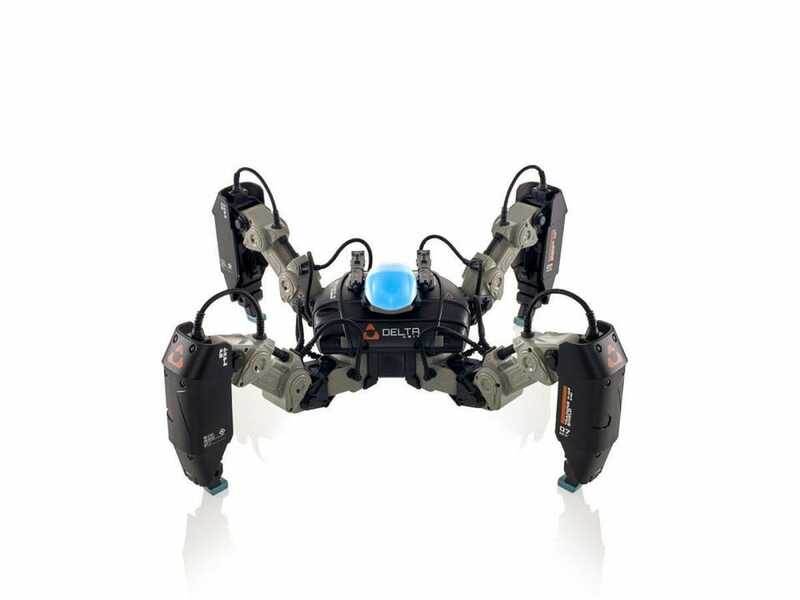 “It gets angry if you don’t play with it, and when it wins games, its behavior changes,” says Christopher Beck, co-founder and CTO of Reach Robotics. The Mekamons will later this year become touch responsive, so that when their owners rub their heads they’ll show “happy” movements such as wagging from side-to-side like a dog. Adekunle’s research team drew inspiration from animal behavior, looking for instance at what horses do when they get nervous. “A large part of our product is emotional,” says Beck. Sharp movements and stamping feet, for instance, can show aggression, while a calmer movement would be slowly rising up and down to suggest breathing. Reach Robotics’ headquarters is part of a nondescript office complex just off Britain’s M3 motorway leading into Bristol. A few dozen engineers are sitting in front of iMacs in its open-plan office, and two rooms that serve as labs for building prototypes are currently empty save for machinery. Adekunle walks into a meeting room toting a rolling suitcase. It’s the same one he used for his demonstration to Apple’s Ron Okamoto and within a few moments he’s taking two of his latest bots out of the case and snapping on some leg casings and a battery pack. Down the line, if one robot is winning battles on the Mekamon mobile gaming platform, it might strut when it meets another, less successful peer. Adekunle has already come a long way from his early experiments as a teen, including a robotic hand made out of baked beans cans, and a robotic face (based on the Kismet robot of MIT’s Cynthia Breazeal) that had tennis balls for eyes and rolled up pieces of paper for ears. Back in Nigeria, where Adekunle was born, he also inadvertently caused a power outage in his apartment block as a kid, when he took a battery and plugged it with some spare wires into the mains outlet. “I was lucky I didn’t get electrocuted,” he says. He was fortunate to grow up in a relatively well-off family; his father was a school principal and his mother was a midwife. But he lacked the exposure to technology that many kids get today. He remembers how one day someone brought a computer to his primary school and the kids who wanted to see it up close had to pay a fee. When Adekunle’s mother moved to Britain to work, times got tough. There was no email, and the family could only speak on the phone once every couple of months. If for some reason his mother couldn’t get access to a landline, Adekunle’s family would be waiting at the other end with no idea what was going on. Two years later, when he was around 10, Adekunle moved to the UK and started going to secondary school. At home he continued tinkering with amateur robotics, getting ideas from YouTube and dabbling in code as a script kiddie; then at university, he cut his teeth on programming in C++ to unlock a wealth of new possibilities. It was here that he started experimenting on the first moving prototypes for what would become the Mekamon. 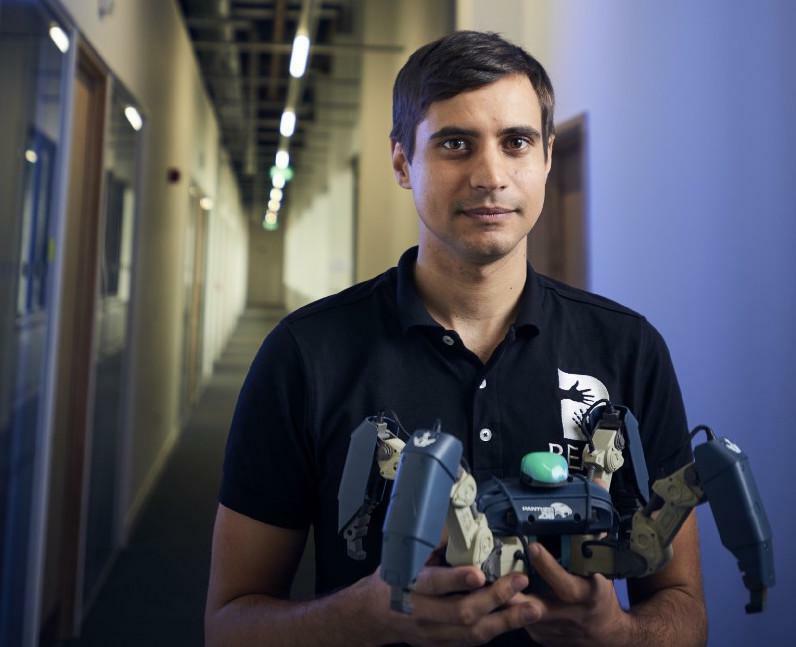 In 2013 he met Beck, who was working on a Ph.D. and had experience in robotics, and asked if he could help develop Mekamon into something that would look like a product. But Adekunle and Beck believed there was a market for a more complex product, a robot with 12 motors when most motorized toys had no more than five. Adekunle, who had previously left the room, now slides open the door to speak to Beck and let him know that some potential investors are about to turn up. Both later sit down for a meeting in their cozy cafeteria space. For his next act, Adekunle is hoping to raise a new round of funds (having already raised $10 million for the company), and also strike some licensing deals with entertainment companies in Asia. Eventually, Mekamon robots might start to come out with branded versions – think Pokemon characters, for instance. “Asia is going to be a huge market for them,” says one of Reach Robotics’ investors and the former CEO of Atari, David Gardner. For now, Reach will continue to make money with direct sales to consumers and with that exclusive deal with Apple Retail.